This girl is a real fan of Ferarri. Just look at this imagine and you'll have the same opinion. 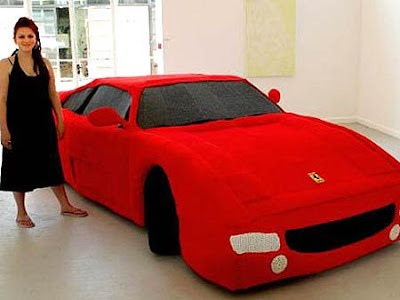 Lauren Porter who is an art graduate, knitted herself a Ferrari out of wool for her Honors degree at Bath Spa university. The classic bodywork consists of 250 squares of garter stitch made by Porter and 20 family members. The windows are V-shaped and the details crochet and the badge is embroidered. The Ferrari stands firm on a steel frame welded by Lauren herself, 22, Greatham, Hants.